This week’s Sunday Supper theme is in honor of National Pizza Month. My idea of “pizza” has expanded exponentially over the years, to include items like this savory onion tart. You can use any onion for this, in the past I’ve used it whenever I had an overabundance of onions from my CSA share. A mishmash of red and yellow will work just fine. Cut the butter into the flour with a pastry blender or your hands, leaving large irregular chunks. Then, mix in the water with a fork, adding it in gradually, careful not to overwork. Split into two balls and wrap with plastic and refrigerate at least an hour (can be overnight). While the dough is chilling, in a large flat bottom pan cook the onions, butter, and rosemary down for about half an hour until they are nice and soft. Roll out the dough, cover with onions, turn up the sides, and bake at 375F for 45-50 minutes. The Verdict: “It tastes like grilled onions on pizza bread,” said DH. I beg to differ. The flaky crust was NOTHING like pizza crust. I could have rolled it out thinner, but I was quite proud of myself. The onions? AMAZING. So sweet. It was almost like a dessert. “I can only eat so many onions at one time,” said DH. And so he only had one piece. I had one piece and a little bit. The flavors were so rich and satisfying that I really didn’t need more. Sigh. THIS is the food I wish I could make more often. Simple, satisfying, low cal. Well, except for the butter . . . I have a recipe for a Roasted Vegetable Galette that is SO good, this kind of reminds me of it. Yum. This looks really good!! yum!!! This looks really good. I have been wanting to make a French Onion soup. This would go great with a bowl of soup! Yes! I need to start making more soups. Oh yum! I need to make this this week with a big bowl of soup! Perfect for fall! I totally agree. And now I’m off to check out your pumpkin pecan paleo doughnuts! 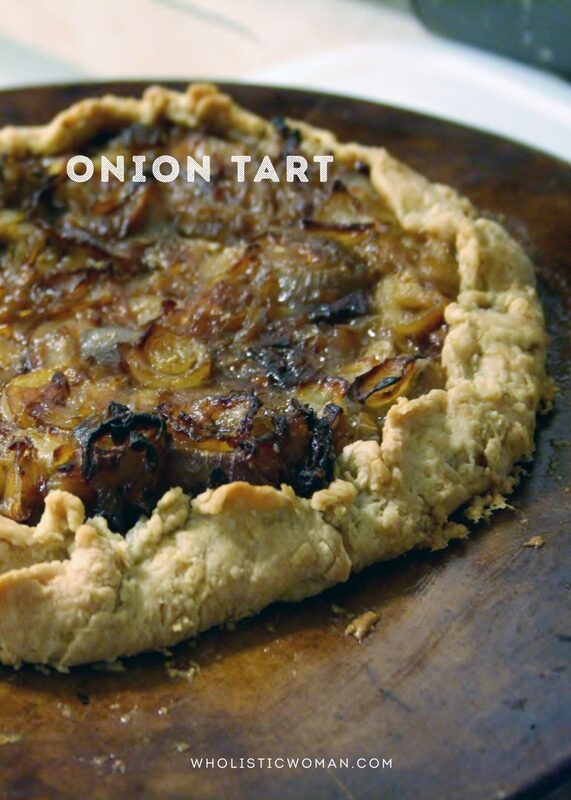 My family would love this onion tart! Definitely going into the “to try” file. This looks yummm! Perfect with a bowl of a soup on a cold wintry night! We have had a wealth of onions in our CSA this fall. This looks like a perfect way to enjoy them! Thank you! This looks delicious and perfect for fall weekends! Those onions are screaming my name! So golden and sweet. Yum! Caramelized onions makes just about everything better! I know I’d love this tart.